Philadelphia Phillies first baseman Carlos Santana celebrates after scoring during the sixth inning against the Washington Nationals. It was an interesting contrast on Sunday, April 29, when the Phillies closed their longest homestand of the season with a terrible 10-1 loss to the resurgent Atlanta Braves at Citizens Bank Park. Phillies’ first baseman Carlos Santana still had his uniform pants on, sitting in front of his locker, staring at his bat almost as if he were imploring the piece of wood for an answer to his recent batting woes. Just behind Santana, emerging from the shower area was a laughing Vince Velasquez, the game’s losing pitcher after being roughed up for six runs on seven hits over four innings. Major league players blow off steam in different ways. Velasquez, to his credit, doesn’t like to dwell, while, it seems Santana, a veteran of 8 years, does. Santana, the Phillies’ highest-paid player at $20 million over the next three years, is hitting .169 and it bothers him. It bothered him when he went 0-for-3 against the Braves that Sunday, and 0-for-4 against Miami the following night. Since then, Santana has gone 5-for-20, upping his May average to .250 and raising his average for the season by 20 points. He knows his time will come, because it always seems to rise throughout his career. As for Santana, he puts on a good front. But the slow starts bother him. “Wanting to get off to a good start is one thing, doing it is sometimes different. But all of my career I’ve been a second-half player,” Santana admitted. “I’ll come around. The weather is getting better, and I seem to hit better when the weather warms. 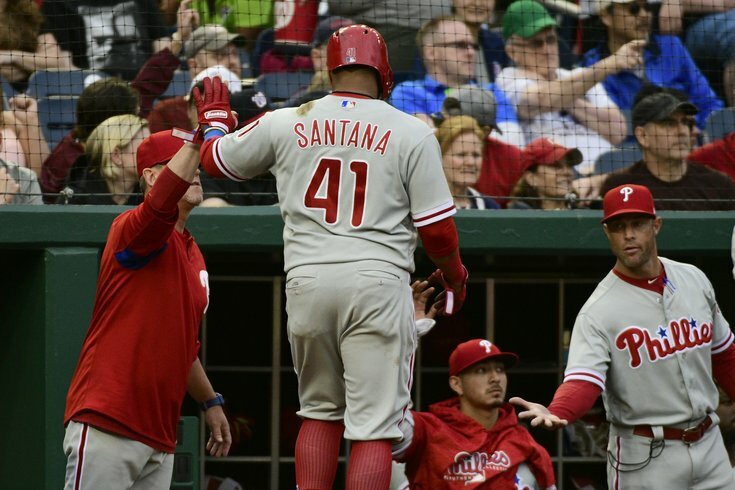 “[Santana] has helped us win a bunch of games,” Kapler said last week. “We think the fifth position in the lineup is a critical one. We also believe in mixing it a little bit with the hot hand makes a lot of sense. One of the exceptional things about [Santana] is the ability to use him in various spots in the lineup because of how flexible he is. “We knew a couple of things about Carlos. He has an ability to get on base, and the power is a real thing. He can and will help us win if he’s anywhere in the middle of our lineup. We think he’ll see some good pitches to drive in the five hole with multiple runners on, we’ve seen that come to fruition the last couple of nights.